Description : Discover a natural, hands-on way to collaborate with the 800 series. 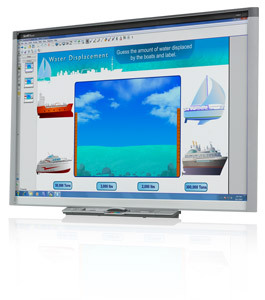 Featuring touch gesture and multitouch capabilities, this durable interactive whiteboard enables true collaboration and makes teaching and learning more engaging. With freestyle interaction, four students can work together anywhere on the surface without being restricted to a defined space or required to use a specific tool. And each can perform different actions at the same time – for example, two students can move objects around while another writes in digital ink.